Cumulatively, The Beatles, Bob Dylan and The Who have been cited by bands as influences for their records approximately 34 million times. But how often have you heard a musician pay tribute to chicken & wild-rice soup with slivered almonds, morel-mushroom soup or chicken-divan soup? 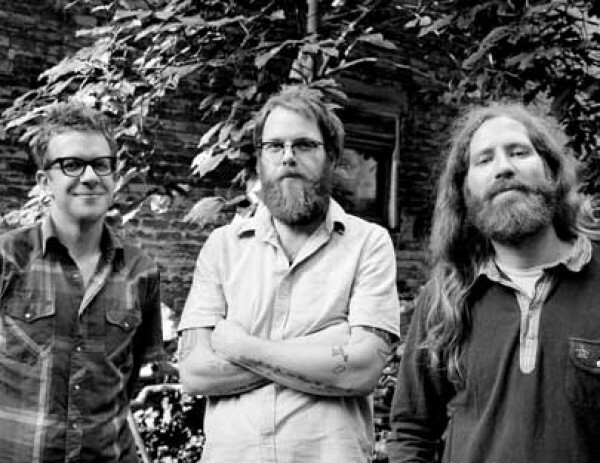 The Durham, N.C.-based folk band Megafaun returned to their native state of Wisconsin to record Megafaun, and their parents’ delivery of homemade versions of the above dishes played a role in shaping the group’s fourth and latest album. During the three weeks Megafaun spent assembling the album at April Base, a studio belonging to Bon Iver’s Justin Vernon, the band occasionally drove home for dinners, but more often, their folks stopped by the recording space with edibles. While the food’s influence on the music isn’t exactly tangible, the importance of family-made cuisine to Megafaun speaks to a few of their ideals. This is a band that prizes family tradition and the idea of harnessing a warm, communal spirit. The group, which includes brothers Brad and Phil Cook, plus Joe Westerlund, see their history traced back to when these men were just 16-year-olds bonding over jazz. All three attended a locally revered jazz camp in Shell Lake, a small town in northern Wisconsin, and upon returning home, the Cooks were so inspired by the immersion and intensity of the week-long experience that they quickly formed Mount Vernon with Westerlund, Vernon and three other friends. “We would use all these jazz exercises, but we were writing, like, pop music. At the time, we were really into Phish and Dave Matthews Band,” Phil says. He recalls those days fondly, especially when he discusses how his current band has retained “a sense of adventure, and a sense of really exalting the moment in time—and how important the moment is in music—and how energy moves between people in moments” they cultivated then. The creation of DeYarmond Edison, a band that featured the Cooks, Westerlund and Vernon, was the final iteration of the group before Megafaun was formed. DeYarmond’s nitty-gritty songwriting duties were handled by Vernon, while the Cooks and Westerlund handled arrangements, textures and other more production-focused duties. Phil Cook points to “You Are the Light” and “Real Slow” off Megafaun as songs that prove their progression in multiple capacities. Compared to Bury the Square, the trio’s 2008 topsy-turvy, sound-collage-friendly, experimental debut, this album shows a band at full ease with more conventional songwriting aesthetics. There are occasionally playful, dizzying twists on Megafaun, but by and large, the record favors delicate, pastoral acoustic instrumentation and solid hooks. It doesn’t revamp the folk idiom, but it serves its purposes well.